Heroin, like cocaine and marijuana, seems to inspire an endless supply of monikers once the drug hits the streets. In case you needed a refresher, there’s “dope,” “smack,” “China white,” “brown sugar,” “Mexican mud,” “black tar,” “horse,” “snowball,” and “Big H,” just to name a few. 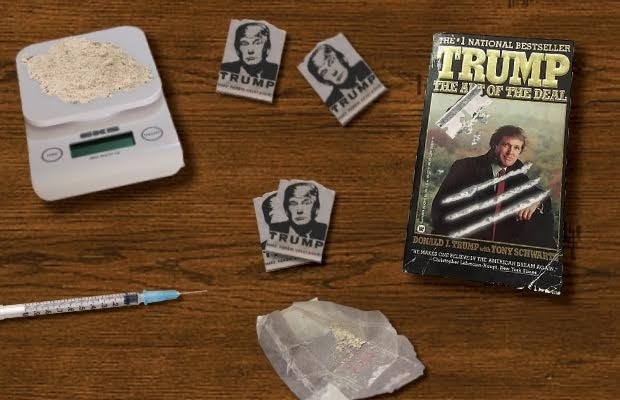 After a six-month investigation into local drug dealing, the Hernando County Sheriff’s Office last month confiscated 5,500 heroin packages, some of which included an image of the president’s face and name, according to NBC affiliate WFLA. Florida Attorney General Pam Bondi, addressing the media at the Hernando County Emergency Operations Center on Friday, was not amused, according to the Tampa Bay Times. No. “Yuuuuge mistake.” The dealer should’ve paid that licensing fee! And did you notice who was doing the talking? Bondi found herself at the center of a controversy during the presidential campaign last year, when it emerged that Trump had failed to disclose an improper $25,000 contribution to a political group connected to the Florida Republican, who was at the time considering whether to open a fraud investigation against Trump University. The donation, made in 2013 by the Donald J. Trump Foundation, violated federal rules that prohibit charities from donating to political candidates, The Washington Post reported in September. Trump and his team also failed to disclose the gift to the Internal Revenue Service, instead reporting that the donation was given to an unrelated group with a similar name — effectively obscuring the contribution. DT: ‘I’d like to thank Floridians for taking that first giant step for mankind’, naming the 5,500 heroin packages after ME, including an unlicensed image of the president’s face and name. So today I’m introducing amnesty for unpaid DT45 licenses, with retroactive fees to be paid immediately. No, it’s an old quote from a Hollywood agent. I wouldn’t doubt for a second that Trump actually makes a profit from this. That’s the only reason he does anything. What lands on the florida shore should stay in Florida Let’s see how good the Louisiana and Georgia law enforcement is. I imagine Trump will sue the drug cartels – – – after he’s done suing all those women who accused him of groping them. This reminds me of the early 80s when they came out with heroin branded as “Hinkley,” because it would make you as crazy as the erstwhile assassin…. Pammy pining for the good ol’ days when drug empires were politically correct.